The enthusiasm for life has come down in the past few days. Reason : bank robbery. Unlike the movie versions, where in a mob of masked people rob innocent victims at gunpoint, we are being looted in broad day light, by a face known and trusted by us – our builder. The weapon of persuasion is not a gun, but our Sales Agreement with them. We signed the document years and years and years back – with hope, enthusiasm and love for our new home. We were seduced with promises of an apartment overlooking a green garden, a school close by, with a huge club house and all the amenities one could wish for. After a lot of wait and a lot of unkept promises later, they have started sending out the final demand letter. The demand letter is really demanding all our money – Escalation charges, apparently. Unexpected. Unprepared. And a real blow below the belt. So right now, we are making a list of items we can sell to sustain ourselves. Hopefully, the laptops will stay! Thank god for these golden beauties that made my day better. Dot them with butter, top with honey and sprinkle some nuts on top – You will almost stop thinking about all your worries, well almost! Check out the original recipe here and a video here. Mix the dry ingredients together (flour, sugar, baking powder, spices and salt) and whisk thoroughly. Mix the wet ingredients (pumpkin puree, milk, oil, egg, vinegar). Combine the two and mix to ensure that there aren’t any dry lumps. Heat a frying pan, oil it lightly and add 1/4 cup full of batter into it. Don’t spread like a dosa, you can check the video for this step. Cover and cook for a minute. Once the bubbles start appearing, flip and cook for another minute. Serve hot with butter and syrup of your choice. This gave me 6 thick filling pancakes. I pressure cooked a small pumpkin and one small sweet potato together. After the pressure dropped, I pureed them and cooked it with milk and the spices above mentioned. I didn’t like the taste of the soup, so used it up as pancakes. The pancakes look very tempting! I should try out some too! I love pumpkin pancakes…I make them quite often…second only to banana pancakes…but I’ve never seen vinegar before in a pancake recipe…I would think it would make the pancakes a little tart? I couldn’t sense the vinegar in the final pancake, the pancake wasn’t tart. That reminds me, the original recipe had a teaspoon of baking soda, which I replaced with baking powder without even thinking twice! I guess the vinegar – baking soda combination is to bubble up and make it fluffier. I will add the baking soda to the recipe, thanks for pointing this out. The pancakes are looking very delicious. The idea of adding roasted nuts as toppings for pancakes is really nice. Pumpkin pancakes sounds good. I would like to add some roasted pumpkin seeds on top of it. Most of the time I replace egg whites by vinegar in baking but never tried in pancakes so will give it a try. So sorry to read about the house. That’s really such a terrible thing. Hope you guys have the strength to tide through this..take care..pancake looks very interesting..I love banana pancake, I must try with pumpkin sometime..
As for the pancakes, the last click speaks volumes!Looks absolutely delicious. Ohhh So sorry Be brave Rajani. God is there every thing gets solved soon.And pancakes looks so inviting. I understand Rajini:-0…..hope we see our dream home soon. Hi Rajini.., Sorry to hear about all the story, hope God will be with you, and help you along the way…, Hope your dream home will come soon dear.., take courage, be patient and deal with the problem in clear mind. 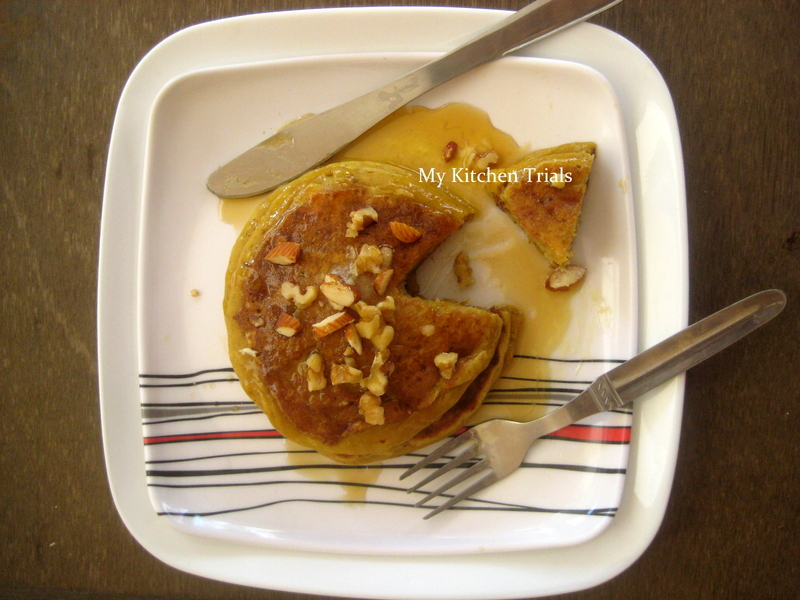 The pancakes look absolutely divine.., the last click makes me drool.., nice one I have made pancakes but without eggs.., should try out with pumpkin sometime.. 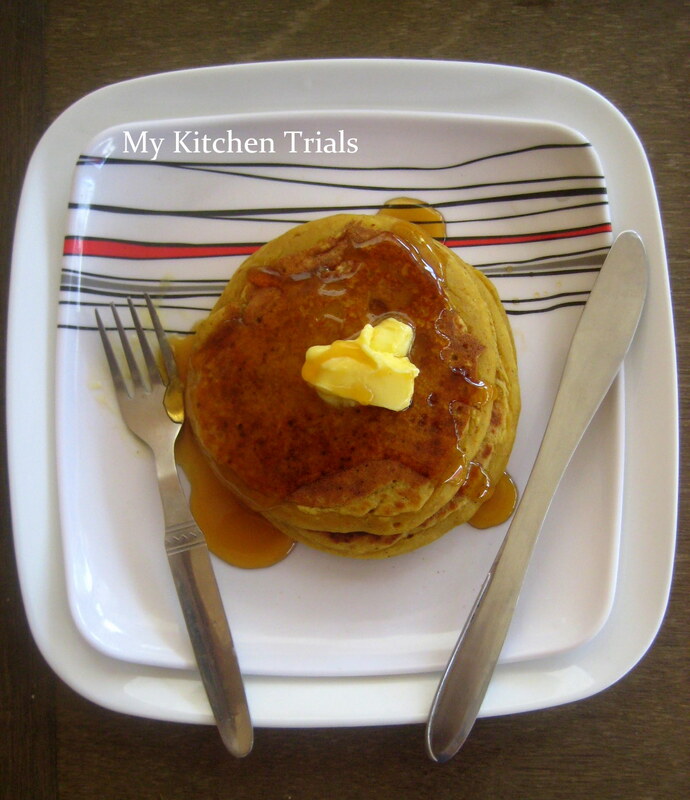 I never tasted Pumpkin pancakes,sounds so delicious…will try this sometime…last click looks more tempting! 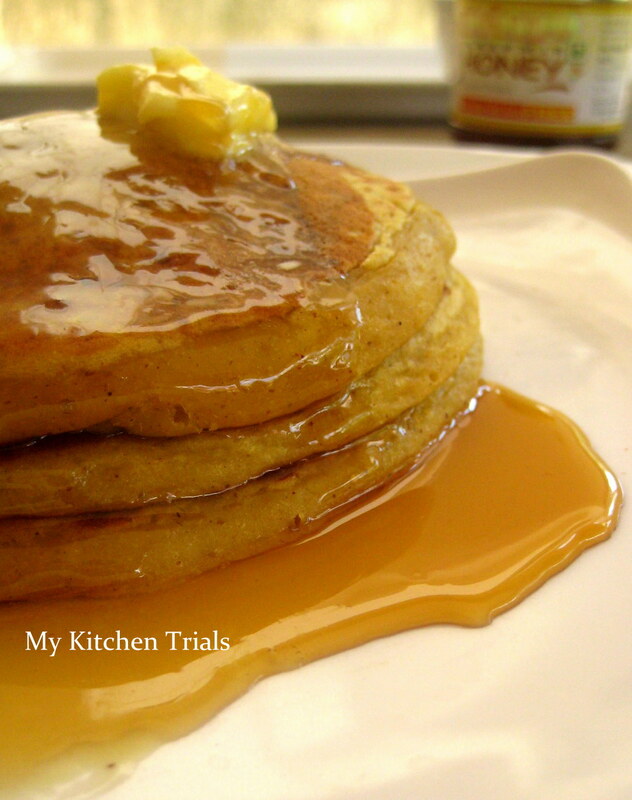 Pancakes drenched in honey n butter, looks yum n inviting!!! Hopefuuly your problems would be sorted out soon. The dosas look delicious.